The warm days of summer have arrived. This is a great opportunity to be active, spend time in nature and relax with family and friends. The following tips will help you support your overall health and wellness this summer. For long days at the beach, the best protection is to cover up. Dress the kids in a sun suit and hat. Adults can find sun shirts at sporting stores. Find shade, or make it yourself. Protect your eyes. 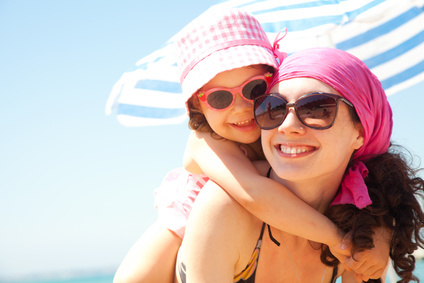 Choose a broad spectrum sunscreen cream with an SPF between 15 and 50. Avoid aerosol spray or powders. A mineral based cream is best (zinc oxide or titanium dioxide, otherwise avobenzone 3%). Avoid ingredients listed as retinyl palmitate and oxybenzone. Visit the Environmental Working Group Skin Deep Database for more info. It’s easy to get drawn into the overconsumption of junk food, sugar and alcohol when camping. Unfortunately this can leave you feeling rotten on your return home. With a little planning you can eat well on holidays and feel your best. Stock up on healthy snack foods such as fruit, pre-chopped veggies, hummus, nuts/seeds and organic dried fruit. Be sure to include protein in your meals such as eggs, organic yogurt, beans and grilled fish/meat. Plan a trip to the local farmers market for fresh veggies and organic produce. Pre-cooked meals such as chili, soup and stew can be frozen ahead of time and will keep your cooler cold until you are ready to eat it. There is nothing better than grilling your dinner outdoors and enjoying a meal with friends. It is well known that grilled meat can expose us to chemicals associated with certain forms of cancer. You can reduce exposure by choosing leaner cuts of meat and fish, grill at a lower heat and trim char off the meat. Marinating meat and fish with anti-oxidant rich oils, cider vinegar, garlic and herbs/spices can reduce chemical exposure by up to 90%. Don’t forget the veggies! Add color and flavour to your meal with grilled asparagus, veggie kebabs, yams, veggie burgers, portobello mushrooms or corn on the cob. Lyme disease is a growing concern in BC. Lyme disease and co-infections can be transmitted through a tick bite. Ticks live in grassy and wooded areas, but can be found in city limits as well. Frequent tick checks increase the likelihood of finding a tick before it can spread disease. Prevent tick bites by wearing protective clothing and insect repellant. Rose geranium oil is a natural repellant for ticks.